The global mobile phone market is expected to reach 2.35 billion units in 2019, up from 1.96 billion in 2014, according to the latest worldwide forecast by technology analyst firm CCS Insight. However, CCS Insight’s annual forecast reveals that despite continued growth in emerging markets, sales in developed markets, notably Western Europe and North America, are close to saturation and are poised to peak in 2017, before falling to lower levels. 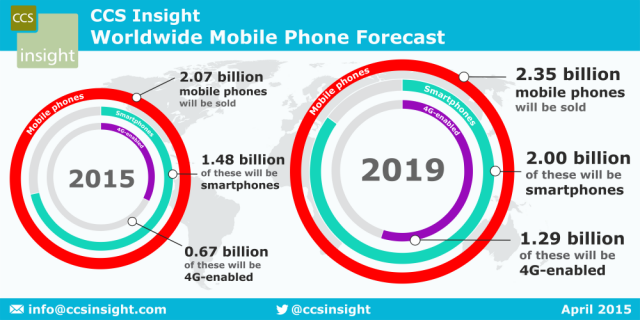 CCS Insight’s forecast highlights the diminishing importance of the smartphone as it becomes one more connected device in a growing range of gadgets. Tablets, games consoles, smartwatches, fitness trackers, virtual reality headsets and other connected devices are now increasingly competing for consumers’ disposable income. Badyal commented: “There’s a lot of competition for a household’s gadget budget and a fantastic array of exciting new devices out there. Compare that with the lack of radical innovation in the smartphone sector and that’s one reason why having the latest and greatest phone isn’t as important as it once was. For many people in Europe and North America, a midrange smartphone with a reasonable camera, a nice large screen and decent battery life is now good enough”. Despite this shift, Apple continues to defy gravity with its unstoppable iPhone. It is taking by far and away the most sales revenue and profit in the smartphone world: in 2014 its share of the global mobile phone sales revenue reached 37%, up from 32% in 2013. CCS Insight’s latest forecast reflects Apple’s ever-increasing share of the smartphone market, which reached 15.1% in 2014 and is expected to continue to grow in the next three years. In mature markets, the iPhone 6 and 6 Plus have proved incredibly popular with people looking to replace older devices, and the increasingly affordable iPhone 5c is bringing in new customers. Furthermore, Apple’s success in opening up new, high-growth markets such as China, India and Indonesia is significant. Although its products are out of reach for many people, the iPhone is widely regarded as a badge of success in these countries and there are still enough buyers who are affluent enough to afford one. Alongside Apple, the smartphone market continues to be dominated by Android. The vice-like grip that Android and iOS have on the smartphone and tablet market is tighter than ever. CCS Insight’s forecast estimates that these two operating systems will account for more than 95% of all worldwide smartphone sales in 2015. However, Google faces a challenge to its Android business model: in 2016, over 30% of Android smartphone shipments, or 400 million devices, are forecast to be not running Google services. Other operating systems have been relegated to also-rans. Microsoft’s Windows is the only one showing any signs of promise, but it is going to need colossal marketing investments to challenge the dominant rivals. Names such as BlackBerry, Firefox, Jolla and Ubuntu remain niche players confined to the “long tail” of the 1.48 billion smartphones sold in 2015. CCS Insight is a global technology analyst company focussing on the mobile, Internet and media industries. It provides comprehensive services that are tailored to meet the needs of individual clients, helping them make sense of the connected world.